Here are a few simple tips for best choosing a Facebook ad photo. There is only a certain amount of space allotted for your Facebook advertisement's photo. If you make it too wide, it will shrink. If it's too tall, you're wasting valuable space on the sides. To best fill up all the area you have, edit your image to be 110 pixels wide by 80 pixels tall. When you can, use a photo with people in it. According to research, this tends to catch the viewer's eye more often than other types of images. Tailor the image depending on the demographic you are targeting. One ad can be copied and re-used for different segments of people. Try to use a photo that will relate with each category of customer you are targeting. Think about all the clutter already on Facebook. What will make your photo stand out? This ad on the left is one of my favorites. It keeps popping up, over and over, probably because it's targeting friends of people who like the page. But it catches my eye every time. Why? Maybe because it is using the space creatively. Although it's formatted to fit the whole area, the feet and bright pop of color really stand out and draw my attention, although they are not cluttering the space too much. Leave out text in the image if you can. There's room on the side for the copy, but if you must add it into the photo, be sure it's large enough to be clearly read. Use a relevant photo. A super catchy image is great, but if it doesn't have anything to do with your advertisement, you will upset more people than you will win over. Test different photos and delete the poor performing ads. Make a copy of the same ad, use a different image for each, and see which ones are getting the most attention. Not only will this help your ad performance, it will tell you a lot about what to use in the future. 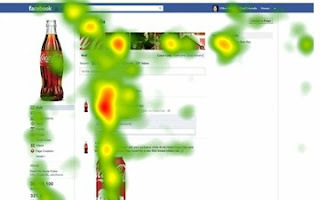 As you can see in this image from the recent article "Here’s What People Look at on Facebook Brand Pages" it's going to be hard to get someone's eye away from where the perceived excitement is. At the end of the day, you will need to think about what your customers will most likely be attracted to, and it might not be what all the studies find. These are just a few of many tips for Facebook ads, and other factors contribute to the success of each campaign. If your ads are not giving you the results you are looking for, seek some help! I will be posting more Facebook advertising tips, so check back soon. A photo advertisement is truly important if you wish to promote your business through Facebook. It's what people usually notice. If they find your photo ad interesting, in most cases, people will view your entire profile. Thus, practically half of the success of your business relies on the advertisement photo. SEO Tip: How Search Friendly Is Your Site?